Ever wonder the difference between speed humps and bumps? Or what kind of streets are best to put traffic calming solutions on? 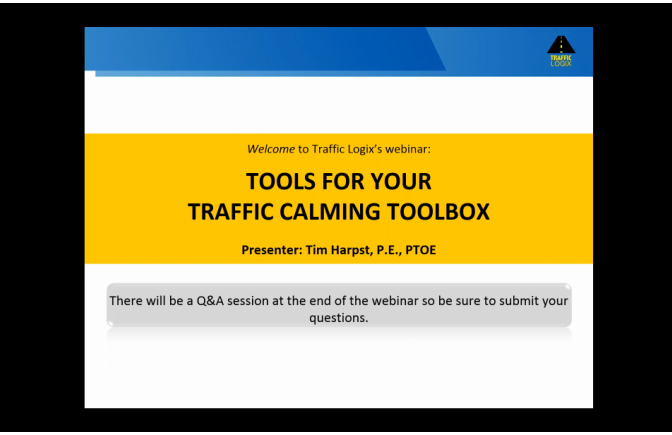 Traffic Logix recently hosted part 1 in a 2 part traffic calming webinar series. Presented by Tim Harpst, former ITE president, the webinar discussed some of the traffic calming solutions that are popular on today’s streets, defining the differences between them and the pros and cons of each. A recorded version of the webinar can be viewed here. . The Q&A’s posed by participants are available on the Traffic Logix site at http://trafficlogix.com/media/webinars. The second part of the webinar will take place in February and will discuss radar signs as well as other solutions for safer roads. Check out part 1 on our site and you can still register to attend part 2 live here.